Since NASA officials ramped up a search in August for missing Apollo 11 moon landing tapes, the team continues to investigate their whereabouts. 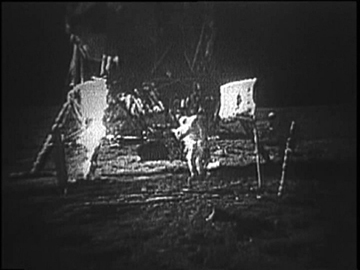 But while the tapes in question have not yet been located, the search has turned up some interesting leads, including some lunar data found on the other side of the globe. 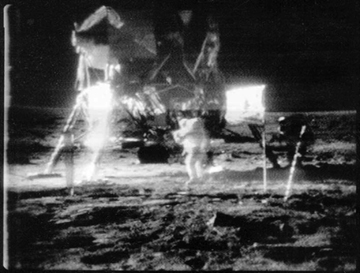 Audiences worldwide saw this dark image of the 1969 moon landing that was degraded during conversion to standard broadcast format. NASA still seeks the original tapes of non-converted data, which might hold clearer images. Image is courtesy of NASA kinescope archive/Colin Mackellar, www.honeysucklecreek.net. In August, NASA's Goddard Space Flight Center in Greenbelt, Md., spearheaded an official search to locate approximately 2,600 boxes of missing Apollo tapes (see Geotimes, October 2006). Some of those boxes contain tapes from the Apollo 11 mission, which likely hold the original data for images of Neil Armstrong's first steps on the moon. The original data  recorded at one tracking station in California and two in Australia  may produce a picture much clearer than the converted format images that most Americans watched on TV. After hearing about the NASA search, Brian O'Brien, who was the principal investigator of an experiment carried to the moon by Apollo 11, recalled boxes of tapes that he brought with him when he moved from Sydney to Perth, Australia, in 1971, according to Collin Mackellar, who provides the tape search program support in Sydney. The tapes, O'Brien remembered, were stored below a lecture room at Curtin University of Technology in Western Australia, where they remained for 35 years, says John de Laeter, who was the head of Curtin University's physics department, and helped O'Brien store the tapes. The storage-room tapes, however, do not include the "Apollo 11 romp on the moon by the astronauts," says Stan Lebar, who worked to design the Apollo Lunar Television Camera that recorded the moon landing. Still, they include data from the Early Apollo Scientific Experiment Package (EASEP), dropped off on the moon by Apollo 11. The goal of EASEP was to test the impact of lunar dust, radiation and other debris on solar cells, to find out if a glass cover would protect them. Temperature and voltage information from the experiments were beamed from the moon back to Earth and recorded on tapes. A Polaroid photo of a monitor at the Goldstone tracking station in California shows the clearer non-converted images of the moon landing. Image is courtesy of Bill Wood, Goldstone MSFN Tracking Station. The tapes found in Australia are only copies, however, of original tapes still held by NASA, according to Bill Wood, a retired Apollo tracking systems engineer, who is helping with the search. Thus, it is unlikely that O'Brien's tapes will provide any new data. Still, the tapes will likely be sent to NASA to see if equipment still exists that can read the tapes, de Laeter says. "While they aren't the tapes we're after, I hope that this discovery will spur others to look in unlikely places," Mackellar says. And the NASA team continues to search, "running down every lead," Wood says. But budget cuts at NASA after Apollo "make this difficult," he says, as many of the necessary records became lost when records divisions at Goddard were reorganized or cut. Still, the team is working to contact retired employees to find out where the tapes might be. "So the search continues," Wood says. "Missing tapes could reveal clearer moon," Geotimes, October 2006. A tribute to Honeysuckle Creek Tracking Station, with PDF of details of tape search.